Today I’ll be talking about how my family gets through this “sick” time of year thanks to this sponsored post written on behalf of Tom Thumb. That’s how it always starts with me. The time was right to pull out my recipe for my Chicken Noodle Soup. After all, the sniffles is just the first symptom. That’s soon followed by a sore throat or tiny cough. I try to convince myself that it’s just seasonal allergies, but sometimes I’m wrong. When the stuffy nose makes an appearance, that’s when I reach for a few things – my blanket, my chicken noodle soup, and some of my trusted Signature Care™ products. You might have seen some of these Signature Care items at Tom Thumb in North Texas area. They are exclusively carried at all Albertsons Companies family of stores, including Albertsons, Safeway, ACME Markets, Jewel-Osco, Vons, Pavilions, Randalls, Tom Thumb, Shaw’s, Star Market, United Supermarkets, Market Street, Albertsons Market and Carrs/Safeway. I stock up on these items BEFORE fall hits, because inevitably with travel, school, and the crazy weather, I’m going to need them. And let’s be honest, when I need them, I am not going to feel like driving to the grocery store. Favorites like the Signature Care Cough Drops Honey Lemon soothe my sore throat, and that stuffy nose, well, thanks to Signature Care Nasal Decongestant Tablets, I can start to feel some relief. Same great quality we all demand, yet a better value. All this, and the products are pharmacist recommended with a money back guarantee! This mama likes that, but I haven’t had to rely on that yet. With Signature Care on my nightstand and chicken noodle soup on the way, made easy thanks to my slow cooker, I’m bound to feel better soon. Oh yes, the slow cooker is a life-saver when this mama is sick. Protein, veggies, some herbs, pasta, and chicken stock – dinner will be good to go in no time. Have you seen the O Organics® line of products at Tom Thumb? Seriously, the line is so extensive that I find almost everything I need is carried. You want O Organics pasta? They have it. O Organics minced garlic? Yes. O Organics boneless, skinless chicken breasts? You bet! I’ve been incredibly impressed and I was able to use so many of the O Organics line in my slow cooker chicken noodle soup recipe. Season chicken with salt and pepper and place into a slow cooker (6-quart or larger). Stir in the following: chicken stock, carrots, celery, garlic, onion, thyme, rosemary, and bay leaf. Cover and cook on low for 6 -7 hours. Remove chicken from slow cooker and shred it. Simply do this using two forks, as the chicken should be so moist, it shreds easily. Put chicken back into slow cooker. Add spaghetti pasta. Cover and cook for another 30 minutes or until pasta can easily be cut through with a fork. 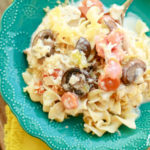 With this slow cooker chicken noodle soup, the house will smell great, you’ll be able to feed your family a nutritious meal, and it will help soothe your throat. There’s something extra special about chicken noodle soup when you are sick. This Honey-Ginger Green Tea recipe will also help soothe your throat! The green tea may help boost your immune system while the fresh ginger lowers inflammation, both incredibly important during the cold and flu season. What foods do you like to make when a loved one is feeling under the weather? This is a sponsored post written by me on behalf of Tom Thumb.